When I was pregnant with my son, I used to daydream about some of the things we would do together as he grew up. I would read him Harry Potter, teach him how to swim, make Swedish Rosettes during the holidays and buttermilk pancakes every weekend. Every parent gets a pretty serious reality check once the actual child arrives. We've had quite a few, but the most gut wrenching by far was our son's diagnosis of life threatening food allergies. Normal, everyday foods can kill him. I try not to live in fear, but the truth is that every time I say goodbye as he goes to school, I wonder if I'll see him alive again. Keeping my child safe is more important than anything else, but I don't want him to merely survive. I want him to love life, enjoy good food, discover a whole world of flavors and eventually become skilled in the kitchen himself. Most importantly, I want food to be something that brings him together with friends and family, rather than separates him from them. As an adult who didn't spend much time with children before having one of my own, I was in for another shock when I started looking at the hydrogenated, over processed, excessively salted, corn syrup laden and fat filled food marketed for kids. Not only is it nutritional garbage, I truly believe that it dumbs down our children's palates. That's when my little recipe organization blog became a mission. I did not want to make food for my son just like everyone else's minus the allergens. I wanted to create something better. I wanted my son to have the lunch that all the other kids wanted, rather than feel left out in the cafeteria. I wanted him to have food worth sharing. 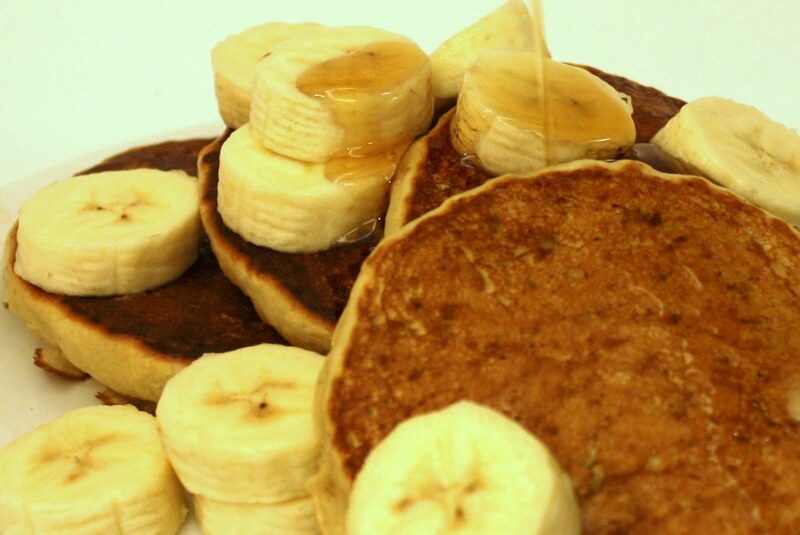 So I'd like to share with you this recipe for Banana Pancakes. I've been holding on to it for a while, and I can honestly say it's been tested more times than anything else I've posted on this blog! I make a double batch every weekend and freeze the extra for The Kid's breakfast during the week. My son does get to have pancakes like everyone else, pancakes his best friend loves to come over and eat with us, because they're well worth sharing. 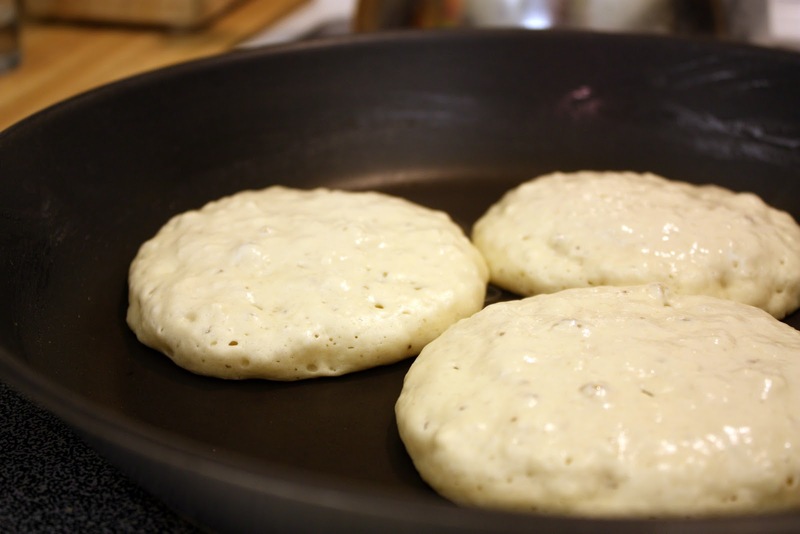 Rub a large skillet, fry pan, or electric griddle with a thin sheet of shortening or margarine. Preheat to medium low or 350F. Sift or whisk together dry ingredients in a medium bowl and set aside. Peel banana and break into three or four pieces, then drop into a large measuring cup or blender carafe. Pour vanilla soy milk into measuring cup or carafe until the volume is equal to 1 ½ C. Add oil and brown sugar to banana mixture, then blend together until smooth with either an immersion or stand blender. Pour the liquid into the dry ingredients and stir by hand until combined into a thick batter. If you choose to add blueberries or chocolate chips, stir into the batter now, rather than waiting until after batter has been poured onto skillet. Using a paper towel carefully wipe excess margarine or shortening from pan. Ladle about ¼ C of batter onto the skillet per pancake. Allow to cook on the first side until bubbles form and the bottom is a golden brown. Flip the pancake, and cook until the second side is also brown. Serve immediately with dairy free margarine, maple syrup, powdered sugar and/or fresh fruit. Makes approximately 7 or 8 six inch pancakes. Place any extra pancakes on a cooling rack in the freezer. Once frozen, move into a resalable plastic bag. Reheat in the toaster or microwave. Update: Eagle Loft Kitchen made a gluten free version that you can find here. This post is my entry for Project Food Blog's first challenge: Ready Set Blog! 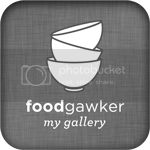 Please consider voting for me (and almost 2000 other amazing contestants) at Food Buzz. Update: Thank you so much to everyone who voted me into the second round! The contest is since closed and I truly appreciate everyone's support. This pancake recipe looks perfected! They look spot on sizzling away in the pan. Okay, I don't know how long you have had that blog header (I am slow), but that should seriously win a blog header contest or something. So, so cute! Off to vote for you now! I am very excited to try out this recipe! Loved your statement, "Most importantly, I want food to be something that brings him together with friends and family, rather than separates him from them." Exactly how I feel. Thanks for sharing all your food ideas! Love your entry, yum pancakes!! Just gave you a vote. 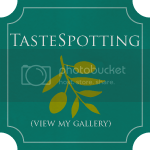 You can check out my entry here: http://tinyurl.com/2ec2hlq Thanks and good luck! One of my best friends growing up was allergic to everything. It's good to see that someone is sharing recipes for those who can't eat everything. He's over all of it now except for peanuts and shellfish, which is wonderful. Before my mom would always have to make something special if he came over for dinner. Got my vote! And these look YUMmy. Thanks for such a great site. I have 3 college kids, one allergic to nuts, one to different dyes, and one to shellfish. Thanks for your recipe.